The exact amount of food and the feeding times will vary depending on the how old your Yorkie is and your dog’s activity. In general, due to his very small size, this breed does best with 2 or 3 small meals per day. While other breeds may do okay with just one main meal, going for such long times in between feedings can cause problems that range from low blood sugar (signs are weakness and clumsiness) to stomach upset (the dog will vomit yellow/white foam). 3 months - 1 year: It is time to now start scheduled meals. If you free fed at this age, housebreaking will be much more difficult, as you will not be able to know when your pup needs to go outside. In addition, when a dog has a well scheduled day this equals better behavior. 3-4 meals per day is best. Morning, lunchtime, early evening (if 4 meals) and evening (no later than 2 hours before bedtime). You will also want to make room for snacks, which should only be given as reward for good behavior or when command training. For this reason, your Yorkie will not be eating a lot of food at each meal time. 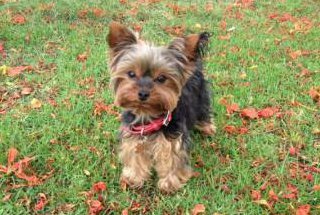 1 Year and on: A Yorkshire Terrier is an adult at the one year mark, so there can be some adjustments to how often you feed your dog and also the type of food (more ahead). At this point, two meals can be given as the minimum. You may find that your Yorkie prefers a bigger breakfast and a smaller dinner or vice versa and that is just fine. As touched on above, if only one meal is given to this breed, it can cause issues including stomach upset. When there is no food in the stomach, bile can build up. Also, going for too long of a time without sustenance can cause blood sugar levels to drop too low. Different foods will have have varying levels of calories; some are calorie dense and others, not as much. Therefore, there is no exact rule such as 1/2 cup for a 6 month old puppy. On average, a growing puppy needs 45 to 55 calories per pound of body weight per day. Adults need less per pound. If you are feeding your Yorkie a manufactured food, you'll want to be sure to read the label, which often shows serving sizes determined by weight. If you are home cooking, this sort of wholesome food is very calorie dense and often less is needed than with dry kibble. 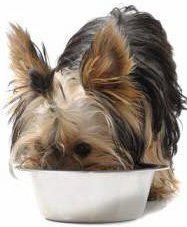 A Yorkie will eat anywhere from 1/4 to 1/2 cup per meal. Weaning Stage ( 4-5 weeks old): When you are transitioning a puppy from liquid to solids, you'll want to start with a base of the same food that the dam has been eating. This will help avoid possible digestive upset that can happen if too many new ingredients are introduced. Added to this is a quality canine milk replacer. Do not use goat's milk, cow's milk or any other liquids. Every few days, a bit less fluid is added in and soon the young Yorkie will be on a fully solid diet. 1) The majority of commercial brands have ingredients that are not beneficial to overall good health. Many have artificial coloring and/or flavors. Simply due to what they are and how they must be packaged, many will also have chemical preservatives. These elements can cause quite a few problems ranging from allergies to digestive distress. 2) You'll want your Yorkie to be ingesting quality proteins. Many packaged brands add such things as meat by-products to reach the protein quota.... and those by-products are often animal body parts such as hooves, intestines and kidneys. Animal meat can legally come from roadkill, diseases animals (that are 'cleansed') and even chickens that die on the way to processing facilities. 3) Many dog foods contain fillers. These are empty ingredients that plump up the food but offer no nutritional value. A dog will ingest a certain amount of food, but a certain percentage of that will pass right through the body since there is nothing in it that the dog's body would absorb. This can cause issues ranging from malnutrition to the behavioral issue of Coprophagia (eating feces). 4) If you do opt for manufactured food, some of the best foods that you can feed to a Yorkshire Terrier include Whole Earth Farms and Orijen brands. Avoid low-quality brands that are found at local supermarkets. Supplements - A full and complete age-appropriate daily vitamin and mineral supplement is recommended. Treats - Take care to avoid brightly colored snacks; these are high in chemical compounds. White or cream colored snacks are usually better. Try to offer real foods such as crisp raw baby carrots for treats. Wondering if your Yorkie is gaining weight at the proper rate?